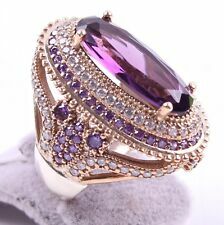 The ring is a contemporary design decorated with sapphires. Ring size: Q. The tail of the fish is attractively decorated with multiple bright cubic zirconia stones. Sterling silver grade 925. Ring size: Q and the ring is hallmarked. Red Coral Sterling Silver Ring. Sterling silver grade 925. 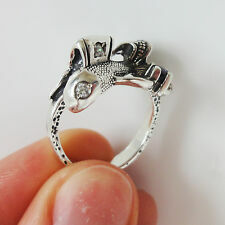 The ring is designed in the shape of a star fish. 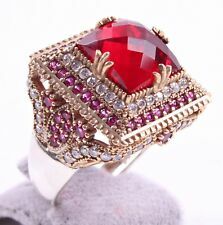 The ring is also decorated with multiple bright cubic zirconia stones that add extra sparkle to the piece. 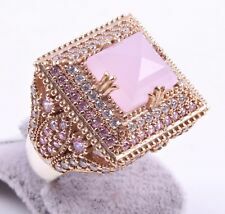 Rose Quartz Sterling Silver Ring. The silver stems of the flowers end with three marquise cut rose quartz gemstones. Rose Quartz is January birthstone. Sterling silver grade 925. Small sterling silver ring shaped as a flower bucket. Tiger's Eye Agate Sterling Silver Ring. Sterling silver grade 925. Genuine sterling silver ring with a natural Tiger's Eye gemstone. Hand-made and unique, a one off! The ring was made in Saint-Peterburg, Russia. 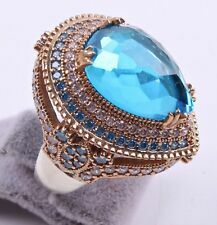 The ring is decorated with blue topaz and white sapphires. There is also a matching pendant. 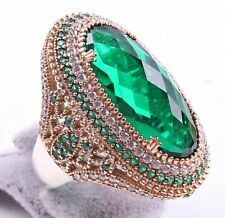 BEAUTIFUL AUTHENTIC TURKISH TURQUOISE TOPAZ GOLD PLATED 925K STERLING SILVER OVAL RING. Turquoise ,topaz 925K sterling silver. Gold plated 925 Sterling Silver. Main Stone Turquoise. Main Stone Shape Oval. 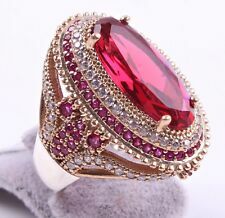 TURKISH HANDMADE JEWELRY 925 STERLING SILVER PEAR SAPPHIRE STONES LADIES RINGS. STONE/STONES: SAPPHIRE. 925 STERLING SILVER JEWELRY. SIZE (us) : ADJUSTABLE. ENTER 1. < ENTER 2. < ENTER 3. 14K white gold turquoise and diamond ring. The total weight of the diamonds is. 18 carats. It is a size 7.5. Sizing is available. This ring weighs 8.8 grams. Main Stone Color Turquoise. Main Stone Turquoise.